The structure of an atmosphere may be discussed in one of two ways -- in terms of the way that its density changes as you go upward or downward in the atmosphere, or in terms of the way that its temperature changes as you go upward or downward. For all planets the density structure is similar, in that the density steadily increases as you go downward and steadily decreases as you go upward; only the rate at which the density changes differs. But the temperature structure, though similar in some ways, is different for the Earth than for any other planet (though it was recently discovered that Pluto's atmospheric structure may be more like ours than previously thought). For all planets there is a relatively rapid temperature increase as you go downward at the bottom of the atmosphere, and a relatively rapid temperature increase as you go upward at the top of the atmosphere; but for most planets the middle atmosphere is relatively cold, while for the Earth, the lower middle atmosphere and upper lower atmosphere contains a heat source due to absorption of ultraviolet light by our ozone layer which makes that region much warmer than it would otherwise be. There is another object in the Solar System -- Titan, the largest moon of Saturn -- which has a similar temperature structure (in its case due to absorption of ultraviolet light by methane), but since Titan is classified as a moon (or natural satellite), the Earth is essentially unique among the planets in this respect. As you go downward in an atmosphere its density steadily increases, and if you go upwards the atmospheric density steadily decreases. That is, the air becomes denser and denser (or thicker and thicker) as you go downwards, and less and less dense (or more rarified) as you go upwards. The rate at which the density changes is normally expressed in terms of the "scale height", which is the height that the atmosphere would have if it were the same density everywhere as it has at the bottom. In the case of the Earth the scale height is about 5 miles, but for all the other planets the scale height is substantially larger, varying from around 10 to 15 miles for Venus, Mars and (when it has an atmosphere) Pluto, to 20 to 30 miles for the Jovian planets. Of course as already stated, the density is not the same everywhere, but steadily increases or decreases with height; so instead of representing the actual depth of the various atmospheres, the scale height represents the distance in which, as you go up (or down), the density decreases (or increases) by a factor of e, the base of natural logarithms, or (approximately) 2.71828. Thus, in the case of the Earth, to observe a change in the density by this factor you'd have to go about 5 miles upward or downward, while in the case of Venus, Mars and Pluto, you'd have to go two to three times as far to observe a similar change in density, and in the case of the Jovian planets four to six times as far. In this sense, we could say that the Earth's atmosphere is more compressed toward the surface of the planet by two to six times more than the atmospheres of the other planets. Mathematicians and meteorologists (people who study atmospheres) love the number e, because it makes the mathematics they use to discuss atmospheres simpler than if they were to use some other ratio of densities. But for non-mathematicians, e seems a cumbersome number, so in the discussion below I consider the change in height required to cause a change in density of a factor of two. Since 2 is less than e, the height involved is less than the numbers previously shown for the various planets. For the Earth, the distance required to change the density by a factor of two is a little over 3 miles; while for Venus, Mars and Pluto it is 6 to 10 miles, and for the Jovian planets, 12 to 18 miles. To see how this works, imagine that you start at the surface of the Earth and climb up a mountain, such as Mount Whitney, which is about 3 miles high. As you rise the air gradually becomes more and more rarefied, until at the top of the mountain, it is only about half as dense as at sea level. This is enough of a change in density that most people, if exposed to such a change in a short period of time, feel somewhat ill. The effects involved, which are due partly to the smaller amount of oxygen in the "thinner" air, and partly to the lower atmospheric pressure, are referred to as altitude sickness; and in rare cases, can be severe or even fatal. For this reason, airplanes which rise above two miles altitude are usually "pressurized" so that the air inside the airplane is the same density as at eight to ten thousand feet altitude, regardless of how high the airplane flies and how low the density of the outside air becomes. But let's suppose that instead of expiring in one way or another, you had no difficulty in rising still further; then you would find as you rise, mile after mile, that the density of the atmosphere continues to decrease at about the same rate of halving the density each three or so miles higher. So at nine miles altitude, the air is only about 1/8th as dense as at sea level and at twelve miles altitude, only 1/16th as dense. And if you continued to rise until you were thirty miles (or ten times three miles) above the surface, you would find that the atmospheric density had dropped by a factor of two ten times over, making it only a thousandth as dense as at sea level. For all practical purposes, at thirty miles altitude you would be at the "top" of the atmosphere, as very few airplanes or ballooons can rise to such heights, as the thin air provides too little "lift" to support an airplane and too little "buoyancy" to support a balloon. But thin though it is there is still air there, and you have to go much higher to reach the actual "top" of the atmosphere, such as it is. Another thirty miles height reduces the atmospheric density another thousand times, to only a millionth of the density at the surface, and another thirty miles another thousand times, to only a billionth of the surface density. But even at that height (ninety miles), a spacecraft returning from orbit or extraterrestrial travel, entering the atmosphere at speeds of 18 to 25 thousand miles an hour, would experience so much frictional heating that its surface (and the surrounding air) would be heated to temperatures hot enough to vaporize virtually all known materials. It is in fact such frictional heating of extraterrestrial objects called meteoroids that causes the phenomenon we call meteors, or "shooting stars". Grains of extraterrestrial material, usually the size of a grain of sand or a small pebble, heat the air surrounding them to distances several times greater than the size of the object, to temperatures of thousands or even tens of thousands of degrees (depending upon how fast the particles are moving). Thus, a 1/10th inch-wide meteoroid might heat a column of air an inch in diameter and tens of miles long as it plunges into the atmosphere, until it is vaporized by the heat of its passage. If you were to go another thirty or sixty miles higher, the air would become even thinner -- millions of millions of times thinner than at sea level at 120 miles altitude, and millions of billions of times thinner than at sea level at 150 miles altitude -- and as a result friction, even for rapidly moving objects such as the International Space Station or manned spacecraft, is reduced to negligible values. This is why we don't say that a spacecraft is "in orbit" until it is at such altitudes, even if it has enough speed to "be in orbit" at lower altitudes. At lower altitudes the gases in the upper atmosphere would not only heat it but also rob it of some of its speed, causing it to gradually spiral into lower orbits where it would encounter denser air, which would cause even greater frictional heating and slowing, so that within a relatively short period of time it would either "burn up" or fall to the surface of the Earth. (1) how strong the planet’s gravity is. A high gravity will compress the gas towards the surface, and as a result any change in the atmosphere will occur over smaller distances. (2) how much each particle of gas ‘weighs’ (or, more accurately, how much mass it has). A light gas like hydrogen doesn't weigh as much, so gravity can’t compress it toward the surface as much as a heavier gas, like carbon dioxide. (3) temperature. If the gas is hot it will tend to expand, if cold it will tend to contract. Scale Height is proportional to temperature / mass per particle / gravity. On the Earth, the Scale Height is about 5 miles, when defined in a particular way which mathematicians love -- a way in which as you go up or down one Scale Height the atmosphere increases or decreases its density by 2.71828 times (e, the base of natural logarithms). They like to do it this way for two reasons -- first, it makes the calculus easier, and secondly, the Scale Height, when defined in this way, is the height that the atmosphere would have if it were all the same density as at the surface. This relationship is directly related to the law of buoyancy as discovered by Archimedes, two millennia ago. When talking about the structure of an atmosphere, all of the planets have one thing in common -- as you go up or down the density changes at some rate. It changes more quickly if the gas is heavy, and more slowly if it is light and expands into space, but all of the planets’ atmospheres get thinner and thinner as you go up, and thicker and thicker as you go down. The differences in different planets' atmospheric structure primarily have to do with temperature. There are various heat sources in a planet’s atmosphere, and where you have them it is warm, and where you don’t it is cold. In general, it is ‘warm’ at the surface. For most of the planets because that’s where the sunlight falling on the planet is absorbed. Either the light is reflected away by clouds or it goes through the atmosphere, and is absorbed at the surface, heating it up. The lowest part of the atmosphere is warmed by its contact with the surface, and as a result is warmer than the layers above. In addition, for the Jovian planets (particularly Jupiter and Saturn) there is a lot of heat coming out of the inside because the interiors of all the planets are hot, and being liquid heat can easily flow from the cores of these planets to the surface. So despite its great distance from the Sun and its very lower temperature at the cloud-tops and in most of its atmosphere, as you go down into Jupiter (and to a lesser extent, Saturn) it gets very hot. Also, for every planet there are very high temperatures (1000 Celsius, typically) at the top of the atmosphere. This is because of bombardment by Solar Wind particles. There’s not much gas hitting the upper atmosphere in this way, but it is going very fast and has a lot of energy per particle, so it substantially heats up the upper atmosphere. In our case the amount of heating is fairly large because we’re fairly close to the Sun. In Jupiter’s case, because it’s so far away from the Sun, you’d expect the amount of energy being delivered in this way to be much less, but the immense magnetic field of Jupiter traps a huge number of Solar Wind particles, so its upper atmosphere is actually just as hot as ours. Other planets, depending upon their distance from the Sun and how efficiently they trap Solar Wind particles (or merely run into them) may have cooler upper atmospheres or warmer ones, but the upper atmosphere will always be much hotter than deep down in the atmosphere, where this heat source cannot penetrate. 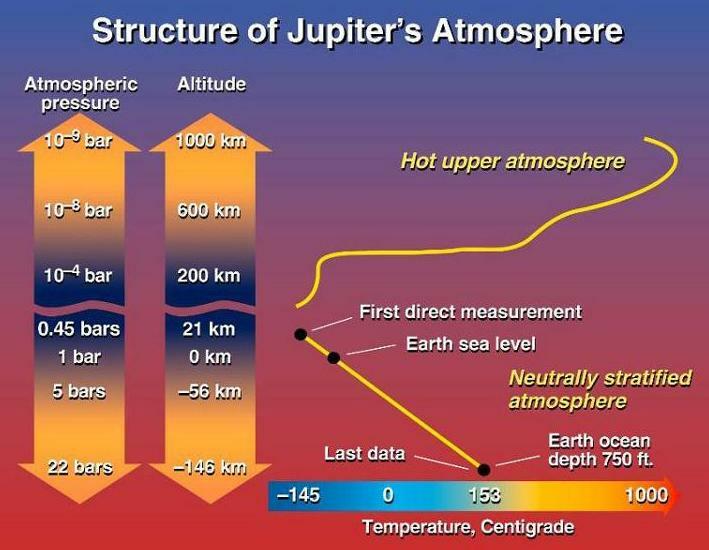 In the diagram above "neutrally stratified atmosphere" means that the lower portion of Jupiter's atmosphere has a temperature gradient (the rate of temperature increase as you go downward) that is on the verge of causing vertical mixing, or convection. If the temperature gradient were to increase even a little (by reducing the temperature at greater height or increasing the temperature at depth), strong vertical mixing would occur, as in a thunderstorm. This would carry heat upward, increasing the temperature at high altitudes, which would reduce the temperature gradient and cut off the mixing. Over a period of time the temperature gradient increases and decreases, allowing mixing and cutting if off, but always remaining close to the gradient which is just barely stable against mixing. The same thing happens in the lower portion of the Earth's atmosphere, or troposphere, as shown in the diagram below. As a result, it might be just as appropriate, and less confusing for beginning students, to call the "neutrally stratified" portion of Jupiter's lower atmosphere its troposphere, as in the case of the Earth. In the Earth’s atmosphere, there is an extra heat source (to be discussed below), so the middle part of the atmosphere is much warmer, and you don’t have a cold trap. The heat source in the ‘middle’ of our atmosphere is due to the absorption of ultraviolet radiation by the gases. There are different kinds of ultraviolet radiation, which are given different names -- UVA, UVB, UVC and so on -- according to how far they are from the visible. The further you go into the ultraviolet the more energy each photon of radiation has (refer to chapter on light and matter, if you haven’t done so, and don’t recognize this discussion). The UVA particles have more energy than visible-light photons, but not as much as UVB, which have less than UVC. All of the common gases in atmospheres (and in fact, most common molecules) can be torn apart by the absorption of UVC and shorter-wavelength, higher-energy kinds of radiation. This process is called photodissociation if it tears molecules apart, or photoionization if it tears atoms apart. This process causes the upper atmosphere to have a large number of ‘pieces’ of atoms and molecules, many of which are electrically charged, leading to the term ionosphere to describe the region, because a charged particle is called an ion. At the same time particles are being broken down by absorbing UVC, they are recombining to make whole atoms and molecules, by running into each other. This happens fastest at the bottom of the atmosphere where the gas is thicker and the particles are closer together, and slower at the top, where the particles are further apart because the gas is so rarified. In the upper stratosphere particles recombine over times measured in minutes or seconds. But if you go up 10 miles (3 times 3) the air is about 10 times thinner, and particles collide 100 times less frequently, so recombination takes hours. Go up another 10 miles, and it would take days. During the day sunlight pours into the atmosphere, allowing UVC to tear apart molecules and atoms in the upper and middle atmosphere, but in the lower middle atmosphere the particles are rapidly recombining, and it takes all of the UVC to keep things ‘as they are’, and none of it makes it into the lower atmosphere. But further up you can maintain a continual dissociation of the molecules, because it takes longer than the Sun is down for the particles to recombine. Ozone is created by the photodissociation of oxygen molecules by UVC. Oxygen and other molecules are being torn apart, and although the other molecules are not part of this story, they also dissociate. This process of turning part of the oxygen into free atoms and ozone occurs throughout the part of the atmosphere (from its "top", downward to the middle stratosphere) where UVC is tearing apart molecules. Now, ozone can do something interesting. Sunlight contains far more UVB than UVC, so as the ozone absorbs UVB and the energy associated with it, it heats up the part of the atmosphere that we call the ‘ozone layer’ far more than it would if it could only absorb UVC. ALL planetary atmospheres absorb UVC, and there is a small amount of heating in the middle atmosphere of each planet in this way. But if you can absorb UVB as well, since there is a lot more of it, the atmosphere heat up a lot more. And ozone can do that, so if you can have ozone the part of the atmosphere where it is common gets a lot hotter than it would otherwise be; but to make ozone you have to combine free oxygen atoms with oxygen molecules, and that’s not going to happen unless you have a lot oxygen floating around. And only the Earth's atmosphere contains significant amounts of oxygen, so that only occurs in the atmosphere of the Earth. Ozone can be destroyed in two ways -- by chemical interactions (molecule runs into other molecules which are willing to take the ‘extra’ oxygen atom), and by the absorption of UVB. During the day both of these are at work, but at night only the chemical interaction is at work. During the day, when both of them are at work, absorption of UVB is more important in the upper part of the ozone layer, where the gas is ‘thinner’ and collisions (and chemical reactions) are less frequent, and chemical reactions are more important in the lower part, where the gas is thicker and collisions are more frequent. In the upper part of the ozone layer, where UVB is the primary way that ozone is destroyed, we can to a first approximation ignore chemical reactions. But in the lower part, where chemical reactions are more important, IF THOSE REACTIONS GO FASTER THAN NORMAL the amount of ozone will decrease. And we can make the reactions go faster by putting halogen gases (fluorine, chlorine, bromine and the like) into the stratosphere, because they eagerly interact chemically with other materials in general, and ozone in particular. The main way we destroy ozone is with refrigerants containing halogen gases such as freon or halon. Halon happens to be a fairly light gas, and as a result it diffuses up/down in the stratosphere pretty easily. 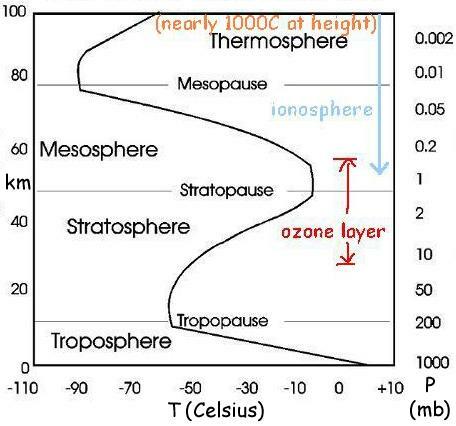 Remember, the stratosphere is ‘stratified’ because, being an inversion layer, you cannot have vertical mixing or convection. HOWEVER, you can have diffusion -- a random motion of gas particles through collisions, back and forth, forth and back, which gradually moves molecules throughout a region. Light molecules diffuse more rapidly and heavy molecules more slowly. Freon molecules are very heavy so they diffuse up or down in the stratosphere over decades. Halon molecules, because they are lighter, do it in years. Because of this the freon now in the stratosphere is a result of freon gas being released over the last half century, still gradually diffusing throughout the upper stratosphere. And now that it is there, it will stay there, even if ALL FREON IN THE LOWER ATMOSPHERE DISAPPEARED, for another fifty to one hundred years. But because it diffuses more rapidly the amount of halon can go up/down in just years, and in fact has significantly declined in the decade or so since halon use was (mostly) banned. Fortunately, since it will be a century or more before the freon is gone, it doesn’t do much damage to the ozone layer in most places. It just makes the breakdown of ozone go a little faster, so the percentage of ozone which is in equilibrium (being made by UVC and broken down by UVB and chemical reactions) is a little smaller than usual -- typically, about 5 to 10% smaller. And that’s within ‘normal’ geological and historical ranges, so although we might feel a bit chagrined at our actions and their results, it’s not a really big deal.